Exciting news everyone!! I have signed a lease on my first real, solo apartment! I'm looking forward to decorating and really making this space my own, and of course updating you all on how it comes along. But for now, I thought I would share the things I looked for in this apartment based off what I liked and didn't like in my last apartment. I found all the listings on Zillow and either made tour appointments in advance via email or just walked in and asked for tours. To start, I knew I wanted to be close to my new campus since I've gotten so used to walking to and from classes each day. I don't always want to walk, but I think having the option is really great. I only looked at communities within 10 minutes of driving to my school and actually landed on the one that is about a 10 minutes of walking away, even better! The next thing I focused on was have way more light in this apartment than I did in my last one. It drove me crazy that our living room and kitchen were so dark, even with lamps. I chose an apartment with a large sliding glass door to the patio and lots of overhead lights to counteract this issues. It is just so much more welcoming when it's brighter. This is as bright as it would get, windows completely open & lamps on. Lastly, I needed a kitchen that I could eat in so that I could put my desk in the dining area. I didn't have a dining area in my last apartment and it was okay because there was a bar with three bar stools to eat at. I was hoping to find a similar option and avoid needing a table. 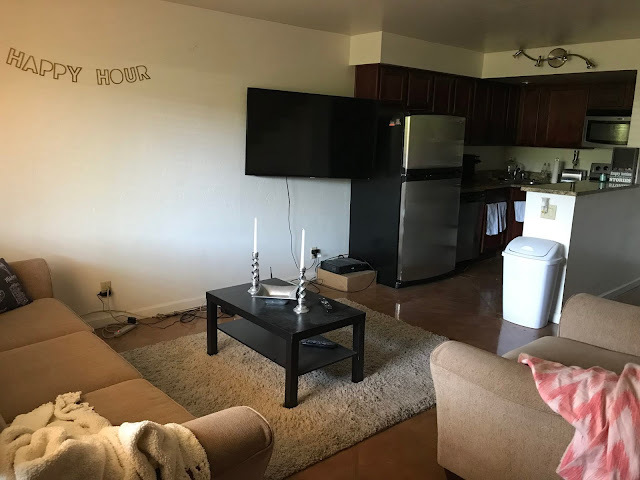 Luckily, all but one apartment I toured had a kitchen counter that worked great as a bar, with the one I chose having a great bar on the outer edge of the kitchen! So far I have purchased quite a few items to fill up this new space, since I'm coming with mostly just bedroom and bathroom stuff. I purchased a three piece patio set for the balcony, an outdoor rug, a new painting, and a couch. I'll give you a hint that the living area will have a blue/gray scheme, the patio a blue/brown scheme, and the bedroom a black/white/gray scheme (yay!). Look out for updates with photos of everything in August when I move in :) If you're currently, or getting ready to apartment hunt I'd recommend making a list of things you absolutely need or want so that you can check them off as a you tour. Then just take a full day and go from place to place looking and comparing until you find somewhere you can see yourself! But think of how cute my new apartment will be!